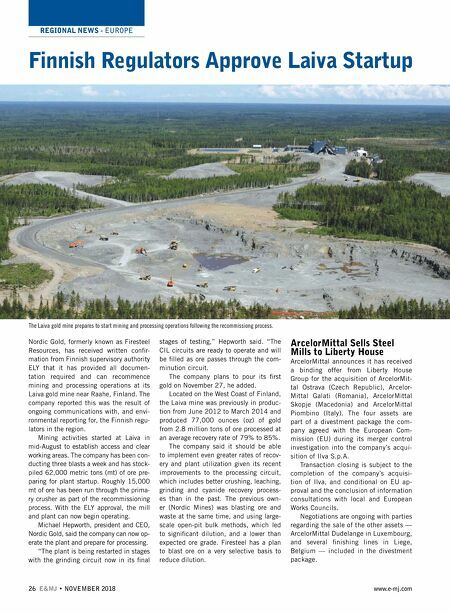 REGIONAL NEWS - EUROPE 26 E&MJ • NOVEMBER 2018 www.e-mj.com Finnish Regulators Approve Laiva Startup Nordic Gold, formerly known as Firesteel Resources, has received written confir- mation from Finnish supervisory authority ELY that it has provided all documen- tation required and can recommence mining and processing operations at its Laiva gold mine near Raahe, Finland. The company reported this was the result of ongoing communications with, and envi- ronmental reporting for, the Finnish regu- lators in the region. Mining activities started at Laiva in mid-August to establish access and clear working areas. The company has been con- ducting three blasts a week and has stock- piled 62,000 metric tons (mt) of ore pre- paring for plant startup. Roughly 15,000 mt of ore has been run through the prima- ry crusher as part of the recommissioning process. With the ELY approval, the mill and plant can now begin operating. Michael Hepworth, president and CEO, Nordic Gold, said the company can now op- erate the plant and prepare for processing. "The plant is being restarted in stages with the grinding circuit now in its final stages of testing," Hepworth said. 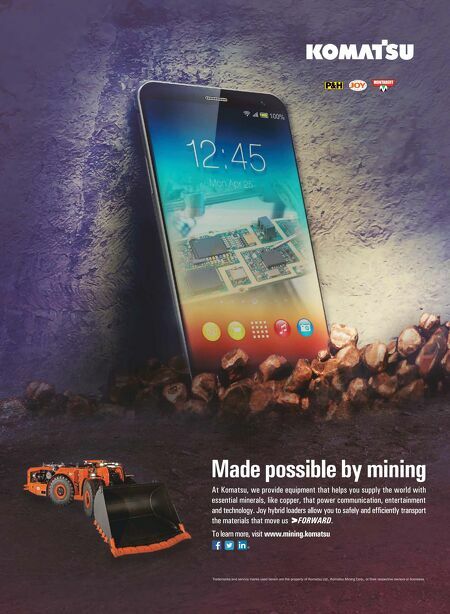 "The CIL circuits are ready to operate and will be filled as ore passes through the com- minution circuit. The company plans to pour its first gold on November 27, he added. Located on the West Coast of Finland, the Laiva mine was previously in produc- tion from June 2012 to March 2014 and produced 77,000 ounces (oz) of gold from 2.8 million tons of ore processed at an average recovery rate of 79% to 85%. The company said it should be able to implement even greater rates of recov- ery and plant utilization given its recent improvements to the processing circuit, which includes better crushing, leaching, grinding and cyanide recovery process- es than in the past. The previous own- er (Nordic Mines) was blasting ore and waste at the same time, and using large- scale open-pit bulk methods, which led to significant dilution, and a lower than expected ore grade. Firesteel has a plan to blast ore on a very selective basis to reduce dilution. ArcelorMittal Sells Steel Mills to Liberty House ArcelorMittal announces it has received a binding offer from Liberty House Group for the acquisition of ArcelorMit- tal Ostrava (Czech Republic), Arcelor- Mittal Galati (Romania), ArcelorMittal Skopje (Macedonia) and ArcelorMittal Piombino (Italy). The four assets are part of a divestment package the com- pany agreed with the European Com- mission (EU) during its merger control investigation into the company's acqui- sition of Ilva S.p.A. Transaction closing is subject to the completion of the company's acquisi- tion of Ilva, and conditional on EU ap- proval and the conclusion of information consultations with local and European Works Councils. Negotiations are ongoing with parties regarding the sale of the other assets — ArcelorMittal Dudelange in Luxembourg, and several finishing lines in Liege, Belgium — included in the divestment package. The Laiva gold mine prepares to start mining and processing operations following the recommissiong process.